Preparation Methods & Dosage :Eat organic apples! To help bulk up watery stools, bake an apple pie with the peel on, or make some homemade apple sauce. Vinegar is used to preserve herbs, and herbs add healthy properties and taste to the vinegar. Strive for two tablespoons of vinegar a day in your diet. Add vinegar to baths and hair rinses. You can use vinegar for most everyday cleaning tasks. It is naturally anti-fungal and leaves the bathroom, windows, and glass ware clean and shiny. The best way to clean fresh produce is a solution of one part vinegar to three parts cold water, which removes 98 percent of the bacteria. Combine vinegar with baking soda, add a few drops of antibacterial essential oils and you can clean just about anything. You can also buy vinegars infused with herbs and spices, but you can easily make your own infused vinegars at home using herbs, spices and fruits. It is a great way to preserve the best of the autumn harvest of herbs from your garden, and you end up with a much fresher, better product. Here are some easy and tasty recipes. Apple Side Effects: Apple seeds are toxic - try not to eat them with your apple, and never consume more than one apples worth of seeds. Distribution: The many varieties of apples that exist today are descended from the wild crab apple believed to be a native of central asia. Apples were imported to North America with the colonists in the 1600s. Vinegar was considered a medicine by the Egyptians, Romans and prescribed by Hippocrates (Greece) for internal and external protection against many diseases. Caesar's armies used vinegar as a beverage, Helen of Troy bathed in it to relax. During the First World War medics used vinegar to treat soldiers' wounds. 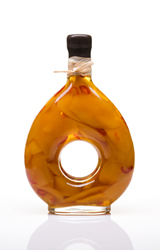 The word vinegar comes from the French word "vinaigre" which means "sour wine." When the wine was first made, natural sugars were fermented into alcohol. Over time, bacteria in the air transformed the alcohol into acetic acid, also known as ethanoic acid, which is the organic chemical compound best recognized for giving vinegar its sour taste and pungent smell. Adele Dawson. "Herbs: Partners in Life" Healing Arts Press, (2000) Apple cider vinegar can turn the alkaline-acid balance in our bodies in favor of acid, which is a preventative against food poisoning. 2 teaspoons in a glass of water daily. Drinking a glass of wine with a meal has the same effect. Crellin, John K., Jane Philpott. "Herbal Medicine Past and Present" Duke University Press, (1990) Herbalists use the apple tree much like its cousin the rose, for its astringent properties. 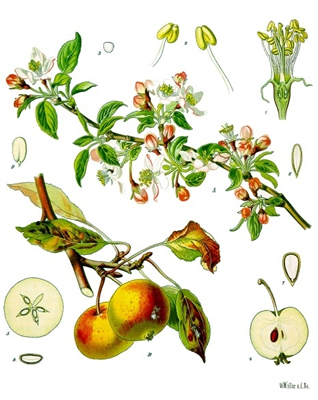 The inner bark of the apple tree as well as blossoms are an astringent tonic, and can be used as an infusion for sore throats. Orly, Cal. "The Healing Powers of Vinegar" Kinsington Books, (January 1,) Potassium in apple cider vinegar promotes cell, tissue, and organism growth. Weiss, Gaea and Shandor. "Healing Herbs, The" Rodale, (1985) Apples contain malic and tartic acids, and salts of potassium, sodium, magnesium, and iron. They are slightly laxative, calming, and purging. 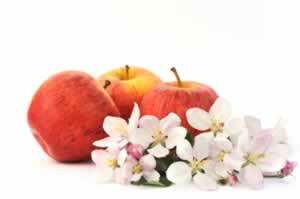 In herbal medicine, apples are regarded as having a cleansing influence on the liver, colon, spleen, and kidneys. Ericksen, Marlene. 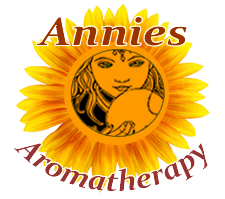 "Healing with Aromatherapy" McGraw-Hill, (2000) The best way to clean fresh produce is a solution of one part vinegar to three parts cold water, which removes 98 percent of the bacteria. Combine vinegar with baking soda, add a few drops of antibacterial essential oils and you can clean just about anything.